Vic Twyman of the Stour Singers recently sent us an article he wrote for Making Music's Live Notes magazine about the choir's 40th anniversary, which ends "Live Music is not without risk. Stour Singers Feast of Music for Christmas 2014 (including unfamiliar pieces by Buxtehude & both Haydns) was severely challenged by the indisposition of the booked soprano soloist - and also of her deputy the day before the concert! 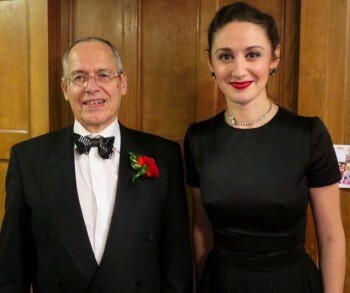 Natalie Montakhab (pictured with Richard Emms) kindly appeared by emergency arrangement with Davies Music, & sang like an angel to save the day." Natalie has been invited back to sing with Stour Singers again in May 2016.